Police are still investigating the Bruce McArthur case and the murders of billionaire couple Barry, Honey Sherman. Toronto police homicide inspector Bryan Bott holds a press conference updating the media and public on the homicide investigation in the death of Julian Jones, 26, of the United States in Toronto on Nov. 10, 2016. 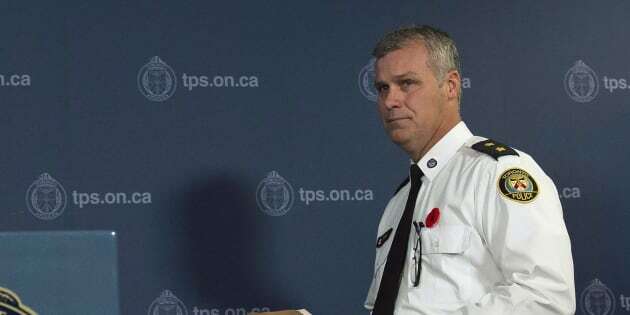 TORONTO — The man in charge of Toronto's homicide squad was sitting in his office early Monday afternoon when word came in about mass casualties in the city's north end. Insp. Bryan Bott put together a team of 16 homicide detectives who were immediately dispatched to Yonge Street, where a white van had struck pedestrians, killing 10 people and injuring 16 others. When the homicide team arrived on location, they found bodies, shoes and debris scattered along a two-kilometre stretch of road. They were joined by hundreds of officers from Toronto and the surrounding area. By Wednesday morning, the massive crime scene had been processed and the street was reopened. But the laborious work for the homicide squad had just begun. "Usually our guys will work around the clock for 48 hours then they have to get some sleep and we cycle people in and out," Bott said Wednesday in an interview with The Canadian Press. "It's been a long haul. It's going to be a long haul." The "long haul" for Bott's team began on Dec. 15, when a billionaire couple — Barry and Honey Sherman — was found dead in their Toronto mansion. The probe in the case is ongoing and no arrests have been made. A month after the Shermans' deaths, another massive homicide investigation was triggered by the arrest of alleged serial killer Bruce McArthur, a 66-year-old self-employed landscaper accused of murdering eight men — most of them with ties to the city's gay village. That investigation is set to soon expand exponentially with officers fanning out around the city and across the province to search 70 properties linked to McArthur, who allegedly hid some of the men's remains in planters. "I've been with the service for 31 years, and I've never seen three cases like this back to back, ever," Bott said, who in addition to keeping an eye on the high-profile cases, tries to make sure his detectives get enough sleep. "We're hanging in there," he said, acknowledging that his team received a lot of help from other forces after Monday's incident. Ontario Provincial Police, York Regional police and Peel Regional police helped with traffic reconstruction investigators to trace the movements of the white van. The pressure on the squad was relieved somewhat when Alek Minassian, the alleged van driver who is now facing 10 first-degree murder charges, was arrested without incident just seven minutes after the first 911 call, said Bott. People gather for a moment of silence at a memorial for victims of the mass killing on Yonge St. at Finch Ave. on April 24, 2018 in Toronto. There are 48 homicide detectives on the squad plus three others on the cold case squad, he said. They are arranged in six units that investigate homicides on a rotating basis. In addition to investigating active cases, the detectives also have to shepherd their other cases through court. The pressure on the Sherman case was unrelenting for months, Bott said, with 16 homicide detectives assigned to the case initially. "We scaled it back," he said. Det. Sgt. Sue Gomes, the lead in the case, remains committed to the Shermans case full time, he said, but some other detectives had to go back on the board. On Saturday, some of those investigators began digging into the homicide of a 23-year-old who was stabbed to death Saturday in the city's east end, Bott said. On Thursday, police released the identity of a suspect in that case and issued a Canada-wide arrest warrant for first-degree murder. "Once that's taken care of, they'll go back and assist (Gomes) on the Sherman case," Bott said. Meanwhile, the McArthur investigation is also going full steam ahead, led by Det. Sgt. Hank Idsinga. Bott said he talks frequently with his counterpart with the Ontario Provincial Police, which have assisted in the Shermans and McArthur cases, and also provided officers following Monday's van attack. "Everyone wants to help," he said. "We didn't have to make the call on Monday, our partner agencies just called and offered." CLARIFICATION - April 27, 2018: Previous reports from Toronto police stated that 14 people were injured in the Toronto van rampage. Officials have since updated that number to 16.